The sun in the pool. Ten circles upon the pond…. Deep in a swamp of the northern section of our Everglades, we spied this solitary Great Blue Heron relaxing on a fallen log. Far in the SWA Trails of the Grassy Waters Preserve — along the outer Owahee Trail — there was little to disturb her. She remained there on our return trip, hours later — at complete peace in the beautiful remnants of this most amazing and completely unique ecosystem. Here’s to hoping that Mother Nature is gentle on Florida, and that Isaac gives us nothing more than nice winds and rains. A shift to the west would be extra kind, to provide Texas with some much-needed rain…. In the meantime, there are many brave and wonderful people working overtime in preparation for the upcoming storm — including 100+ Abandoned Dogs of Everglades Florida. This group rescues dogs, abandoned and left to fend for themselves in the harsh wilderness of the Everglades (along with cats and even horses). They provide these animals desperately needed medical attention (many are starving), and find foster and permanent homes for them. Much luck and love to these volunteers. Beautiful photograh! We have blue herons that come in spring to feed among the grasses in a meadow next door. I love to watch them. Also love the poem by Merton. Many thanks for liking my post on “walking with flowers” and following my blog. I’ll be following yours now too. I love what you’re doing here. May you be spared the wrath of Isaac! And, here’s to pushing little Isaac west, west, west to lands that need his rain. Our thoughts are with you, the people and the wonderful eco-system of Florida. Great Merton passage, great pic, great text- important cause. Thanks so much! A few others have used this Merton passage, but when I spied this solitary heron, in a most lovely secluded swamp, I couldn’t resist. And, this is a most amazing cause — one full of loving souls. It never occurred to me that anyone would abandon domesticated animals into the Everglades. People surprise me all the time. By the HUNDREDS. More. Horses, dogs, cats… You should visit the link I provided; It’s amazing what they do. And these animals aren’t prepared for the wilds of the ‘Glades — most often, they’re near-death with starvation and dehydration. Humans need a reality check, yes? Yes: Right upside the head after being dumped in the remote wilderness, naked. Ain’t it though?! >:-D Wilderness “camps” for buttheads! THANK YOU SO MUCH. SUCH A BEAUTIFUL POEM, A GORGEOUS PHOTO (AS USUAL – YOU ARE TRULY A MASTER!!!) AND INFORMATIVE POST BUT MORE THAN ANYTHING BEAUTIFUL. THANK YOU, THANK YOU AND THANK YOU ONCE MORE!!!! Lovely photo! I’m stunned to learn that people abandon animals in the Everglades. I’m speechless at the stupidity…! Beautifull photos and love the poems on some of the work too! loved your blog! thanks for visiting mine and the great comments, so fun meeting you the other day at work. hope to see you again soon, we need to go shooting togeather!!! signed up for future posts as well. This is such a lovely post, and I really enjoy the poem. Have a great weekend! Thanks so much… Others have used this Merton poem, but I thought it was appropriate with the lone heron, and the approaching hurricane. I do echo the others with love of the poetry…. great find!! And the scene..just the kind I love..with dappled light in the background, wonderful light and detail on the solitary bird and great reflections!! Thanks for the lovely view!! Thanks — others have posted this Merton poem, but I couldn’t resist doing it as well — especially with the lone heron! 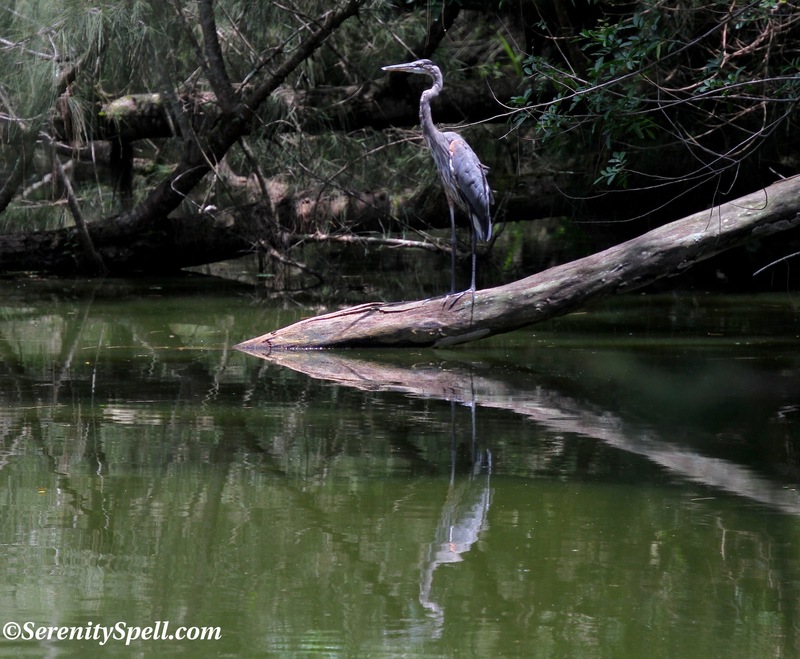 This swamp was amazing… It’s rarely visited, so the animals are at peace in their natural home. It’s just magnificent — you must visit!! Such a serene scene! I also hope that the storm will turn out to be a gentle one! Thanks so much — it’s looking like he’s a-veering! This area is just wonderful; it’s tucked away, with lots of (rare) first-growth. It’s heartwarming to see the animals so at peace in their natural environment. Love poetry.. thanks for including it. Much respect for the dog volunteers!!!! And last but not least…like the Heron shot with the reflection and prominent ‘V’. Thanks so much!! I loved the scene — she was so far in the swamp, I nearly fell in to get a decent shot to avoid the overhanging trees. Hah! What wonderful work those people are doing. How terrible for the animals to be abandoned. I do hope Isaac avoids the area and that all remain safe. This group, and these people, are so very brave and devoted — in the face of a county and city that chooses to IGNORE the entire situation. It’s pitiful. Thank goodness for them, though, and all the good they’ve done. Wow… it never occurred to me that people would abandon their dogs and cats in the Everglades. I’m kind of speechless at that. I grew up in rural Pennsylvania. All the time people who didn’t want their cat or dog would just stop their car in front of a farm, let their cat or dog out, then speed away in their car while their hapless, disoriented animal watched their dust recede in the distance. I thought that was horrible, but leaving a domestic animal in the Everglades seems horrible and then some. Can you believe humans would do this? Cruelest species by FAR. It’s the same as what they do in any rural area… Except the Everglades are a very inhospitable place for non-native critters, obviously. They simply don’t have a chance. We rescued one of our kitties exactly as you describe, in rural NJ. Someone left a box of kittens on the ROAD. Not far enough from the cars, unfortunately, to ensure that all the barely-weaned kittens would survive. I’ll never understand. Can you imagine that fear, anxiety, confusion, abandonment? Thank goodness for people like this group — and the kindhearted individuals, of which there are so many — who help these animals.